The latest look-ahead for China by the UN’s Food and Agriculture Organization (FAO) sees a big jump in cereal imports. The FAO’s recently published Global Information and Early Warning System, GIEWS, country brief says that total cereal (barley, maize, wheat and rice) imports for the 2011/12 grain marketing year, which runs from July to June, will reach at least 9.2 million tonnes, a new record, and a 92% increase on the 2010/2011 figure. This is despite ‘significant’ increases in cereal production over the past few years, including another record harvest this year which saw prolonged drought conditions in several regions in the country. The increase reflects government efforts to provide irrigation to drought-affected farmers, and higher procurement prices intended to encourage the production needed to meet rising self-sufficiency targets. Supply still struggles to keep up with demand so government will need to sustain its policy measures to stabilize domestic cereal prices, whose sharp rises over the past year have been significant contributors to consumer price inflation. Footnote: During last winter and spring, China spent 216 billion yuan ($34 billion) on infrastructure to improve water supplies to farmland, an official with the Ministry of Water resources told the annual central conference on rural work in Beijing this week. That was a 44% increase on the same period a year earlier. Spending is expected to rise a further 10% to 258 billion yuan during this winter and the coming spring as the push to sustain agricultural production is maintained. Beijing’s plan to sink 1,350 wells across the North China Plain (see map, right) to alleviate the drought in the country’s wheat belt that has persisted since October is a sticking-plaster not a cure. We don’t yet know the details of the proposed drilling, but it is a fair bet that the wells will have to drop to the deep aquifer. The plain’s water table has been shrinking for years under the onslaught of desertification, urbanization and industrialization, compounded by periodic droughts. The result has been to make the plain increasingly arid as the water table has been unable to replenish itself adequately. Drawing water from the deep aquifer is equivalent to a pensioner dipping into their capital once the interest from it becomes too small to live off. The North China Plain needs a modern irrigation system and a comprehensive water conservation policy that encompasses both the wheat lands and the water-hogging cities on the plain, notably Beijing and Tianjin. Beijing has plans, including grand plans, and has recently been throwing money at emergency drought alleviation and making water conservation a policy priority as the leadership gets evermore anxious about the grain supply. But it is all too reactive. For a country that prides itself on its central planning, its water management has been weak. Governments often suspend the laws of economics when it comes to agriculture because of national food security concerns and a desire to support rural communities. There are plenty examples around the world of governments spending vast sums of money on irrigation schemes to turn deserts green. Yet this Bystander is starting to wonder if policymakers should be starting to think the unthinkable: at what point does watering the North China Plain start to become just too expensive, and a new sort of agriculture become needed. The snows in Henan have spread to Beijing, with the capital getting its latest first snowfall of the season in 60 years. Snow and sleet have also been falling in Gansu, Shaanxi, Shanxi, Henan and Anhui. But it is too little too late to do much to alleviate the drought across the North China Plain that has persisted since October and is reckoned to be the most serious in six decades. Worse the official forecast is for the abnormally dry weather to continue for the foreseeable future. If it lasts into spring, as the U.N.’s Food and Agriculture Organization has warned, the winter wheat crop due to be harvested in June will be at risk. To give a sense of the scale of the impact of the drought on the wheatlands of the North China Plain, acreage equivalent to half the size of South Korea has been damaged by the lack of rain fall. Meanwhile nearly 3 million people there face shortages of drinking water. The drought on the North China Plain, the country’s main wheat growing region, that has lasted since October already alarms Chinese authorities, who say Shandong, the province at the epicenter and which has had only 12 mms of rain since October, is facing its worst drought in 200 years. Now the U.N.’s Food and Agriculture Organization (FAO) has issued a special alert — which means an early warning alert — about the situation. The agency says the June harvest of the winter wheat crop is at risk from the substantially below normal rainfall on the parched plain and from the diminished snow covering that has reduced the protection snow usually affords against plant-killing frost. Although the current winter drought has, so far, not affected winter wheat productivity, the situation could become critical if a spring drought follows the winter one and/or the temperatures in February fall below normal. In the maps below, the redder the area the more below average has been the cumulative rain and snow fall between October last year and January this. The worst affected area, circled in blue, falls directly over the plain. 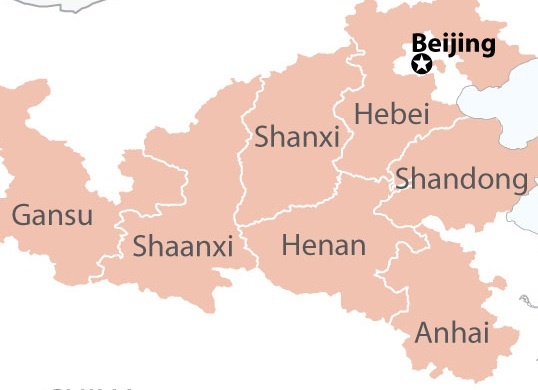 The main provinces affected are Shandong, Jiangsu, Henan, Hebei and Shanxi. In 2009, they produced 75.6 million tonnes of China’s 112.5 million tonnes of wheat, or 67%, a typical share. Offical estimates are that 5.2 million hectares of the 14 million hectares under winter wheat in these provinces may have been affected by the current drought. It has also left more than 2.5 million people and 2.8 million livestock facing shortages of drinking water. China, we should note, is not facing a risk of imminent food shortages, even if the June wheat crop should fail; it has reserves and can import. However, wheat prices are already rising. The national average price of wheat flour is a sixth higher than a year ago. That and the worldwide rise in agricultural commodities prices are feeding through to persistent domestic consumer price inflation and the latest interest-rate rises, despite price controls introduced last year. Longer-term, authorities are concerned that China’s grain production, after seven successive years of increases, is hitting a plateau because of structural shortages of land, hands and water. The North China Plain, 410,000 square kilometers of the most water-starved area in China, has become a poster child for the problem. A long record of deforestation and desertification has led to the erosion of former farmland. Urbanization, industrialization and the rapid growth of cities such as Beijing and Tianjin at the north-eastern end of the plain have gobbled up more farmland and caused the water table to sink lower and lower year after year. Shallow village wells are drying up. New wells are having to be sunk into the unreplenishable deep aquifer under the plain. Recurrent droughts only amplify the problems. It is going to take more than normal rainfall to turn the increasingly arid North China Plain green again. The government is allocating vast sums not just to drought relief efforts but also to water conservation infrastructure and grand if controversial plans to draw irrigation water off three western and southern rivers through a series of canals and pipes — a project that will cost more than the Three Gorges dam. Three months of drought across the North China Plain is leaving millions short of drinking water, Xinhua reports. There are concerns that the situation will worsen. Lack of rain has affected the wheat growing belt across six provinces from Shandong on the coast to Shanxi in the center of the country. Hebei has had only 2 mms of rain since November, 80% less than normal. Shandong is said to be facing its worst drought in a century. Fire trucks are delivering drinking water to residents. A fifth of the farmland planted to winter wheat on the North China Plain, some 2 million hectares, has been affected by the drought. Direct economic losses are put at more than 1 billion yuan, with more to come as there is no relief to the drought in sight. Cloud seeding to induce rain and snow is likely. The government, concerned about the effect of the prolonged drought on the spring harvest of the winter wheat crop, has already allocated 4 billion yuan ($607 billion) for farm irrigation and rural water conservation. Last week, following a State Council meeting on the current drought chaired by Prime Minister Wen Jiabao, it allocated a further 2.2 billion yuan to drought relief. Wen visited drought affected areas in Henan last week. The record grain harvest last year despite a string of natural disasters masks the challenges facing China’s growers of wheat, rice and corn. A richer and growing population, urbanization and natural and man-made water shortages mean that supply is struggling to keep up with rising demand. The annual agriculture policy planning meeting last month noted that China’s 2010’s harvest of 546.4 million tones of grain, up 3% from the previous year, marked a seventh consecutive year of rising grain production, but also expressed concern at the vulnerability of the country’s harvest, particularly the wheat harvest, increasingly concentrated on the drought-prone North China Plain. Less trumpeted was a concern that China is reaching the the edge of its capacity to keep its grain harvests increasing. Agri-technology is still boosting fruit and vegetable yields, but grain may have already reached its limits after decades of seed and fertilizer improvement. Meanwhile grain farming remains inefficiently small scale and labour intensive, with acreage and younger farmers alike being lost to towns, exacerbating the longer-running effects of erosion, desertification and other environmental damage. Stocks and imports cover the gap with increasing demand, so there is little risk of shortages. China already imports more than 4 million tonnes of corn (mainly for animal feed) and more than 1 million tonnes of both wheat and barley a year. But being subject to world commodity markets pushes up prices, and no country likes to feel it can’t be self-sufficient in food, especially when it has an increasing number of mouths to feed. The balance between supply and demand is now so finely balanced that the government says it felt it necessary to spend 828 billion yuan ($125 billion) to boost grain production and combat natural disasters in 2010. It is impossible to break down that number in any detail, though China lost 3 million hectares (7.4 million acres) of crops to natural disasters, by the official count, with a further 20 million hectares of farmland damaged. To put that into context, the UN’s Food and Agriculture Organization estimates China to have 137 million hectares of arable land. China itself reckons 120 million hectares to be the minimum needed to maintain food security. All agree that the hectarage is moving in the direction of the smaller number, with the shrinkage of the area under grain shrinking causing most concern. Financial incentives to farmers to raise grain output have not been effective hitherto. The Party’s annual economic planning session held ahead of the farm-policy planning meeting agreed to increase subsidies further for agricultural production and steadily raise the minimum state grain purchase price this year. And there has been a crackdown of sorts on the illegal conversion of arable land to industrial use. But none of that does anything to stop water tables falling across the North China Plain, the country’s bread basket. There cities and industries consume ever more water and drought has become more commonplace. Depleted aquifers and dried-up irrigation wells are leading grain farmers to turn to low-yield dry-land farming, abandon double cropping and even farming altogether. Grain needs copious amounts of irrigation. Nationally, agriculture accounts for two-thirds of the country’s water use, though it accounts for only 13% of GDP. Water conservation is to be “one of China’ s major tasks in agricultural work” this year, according to the statement issued after the farm-policy meeting which laid out 2011’s priorities to be to “step up research and development into water conservation projects while keeping grain supplies stable, increasing farmers’ incomes and deepening rural reforms”. Notably, water conservation rates mention ahead of two 0f the country’s top economic policy objectives, food price controls to fight inflation and raising incomes for the 850,000 who work on farms to close the urban-rural wealth gap. State media say the government expects to spend 200 billion yuan on water-conservation projects this year, 10% more than in 2010, with priority given to irrigation projects that improve grain output and that combat drought and floods. Over the next ten years it expects to double its current average annual investment in water-conservation infrastructure. Whether it will be enough will partly lie in the hands of nature and the extent of the damage the inevitable floods and drought will cause. Either way it looks like being a damned close run affair.